Aside from the abundance of Patriots fans, there may be no better place in the fall than New England. 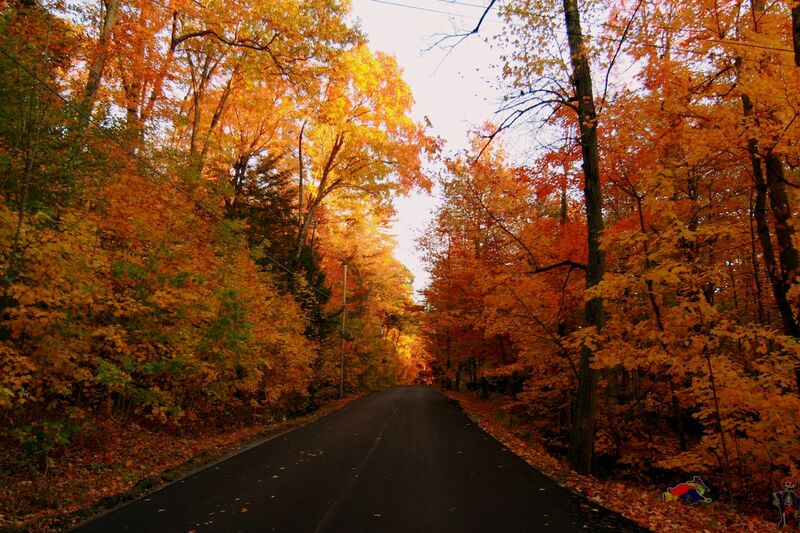 The deciduous trees covering the vast woodlands in the Northeast make for stunning bright colors stretching on for miles, and some of the most spectacular drives in America. The region is stocked with roadways just begging for a fall road trip, spending a few days traversing the mountains of Vermont, New Hampshire, and other nearby states. While you really can’t go wrong anywhere in the region, here are the absolute best of the best scenic fall drives in New England. Though driving through the smallest state in America won’t take you long, this road through Blackstone Valley — the birthplace of the Industrial Revolution — packs more history and bright colors into its slice of I-95 than most American interstates. The top attraction along the route is the Slater Mill, the first successful cotton spinning factory in America. After, you can hit up the Roger William Park and Zoo and stroll through its 435 acres of foliage and animals. If you want to see the colors from somewhere other than your car, hop aboard the Blackstone Valley Explorer Riverboat or the Blackstone Valley fall foliage train tour from Woonsocket to Putnam, Connecticut. Or if you really want to get out onto the water, you can book an entire boat via Airbnb at the Samuel Slater canal boat set along the Blackstone canal. 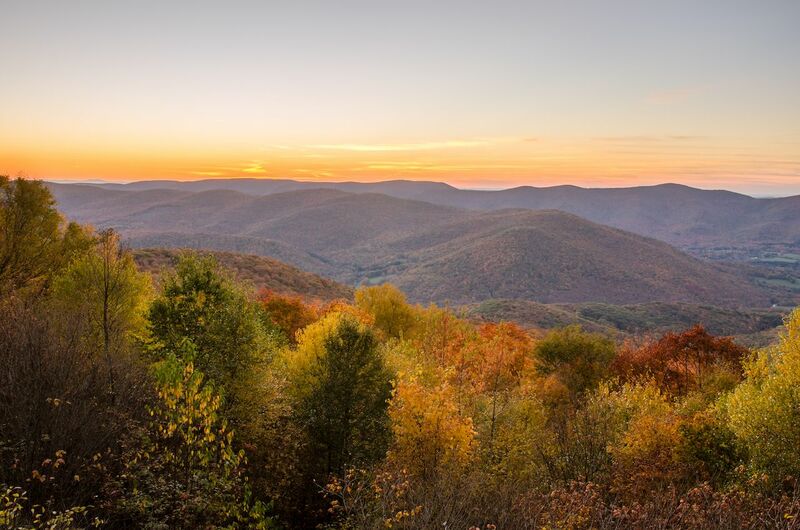 Start out in historic Battleboro, driving through bright rolling hills covered in farmland, past Green Mountain National Forest — which this time of year could just as easily be called Orange, Red, and Purple Mountain National Forest. The vibrant trees pass in the distance as you get to the West Dummerston Covered Bridge, then you can stop in Newfane to do some antiquing at Jack Winner Antiques. Continue on to Grafton and Jamaica State Park, where, weather permitting, you can get out and stretch your legs with a walk along the West River. Stay the night in Manchester, where after a visit to the former home of Abraham Lincoln’s son at Hildene, you can sleep at the Kimpton Taconic with sprawling views of the Taconic and Green Mountains. In the morning, head up the Stone Valley Byway to Lake St. Catherine State Park and see all those spectacular fall colors reflect off the water. An appropriate final stop on your journey is the Robert Frost Interpretive Trail in Ripton, where you’ll arrive armed with a newfound understanding of why he loved this region so much. The Kancamagus Highway — or The Kanc, colloquially — runs through New Hampshire’s White Mountains and is the best driven during October to get the full effect of the famous fall colors. Begin the drive in Lincoln and roll 37 miles through the mountains, stopping at the Bretton Woods Canopy Tour to zipline through some of the best of the autumn foliage. Continue into Franconia Notch State Park, where a much less heart-stopping aerial tramway takes you above all the orange and red. Be sure to leave time to hike through the covered bridges and epic waterfalls at Flume Gorge. If you can, take some time to stop at Kimball Farm, where ice cream and apples will fuel you up for the drive. Then end your drive in North Conway, where the White Mountain Hotel and Resort will offer the best lodging with views of the mountains and cliffs in the distance. Enjoy a seafood feast there, or take the Conway Scenic Railway so you can enjoy speeding by the fall colors without having to pay attention to the road. Known informally as the Mohawk Trail, this drive is the best way to catch the legendary fall colors in the Berkshires, traveling between the Hudson and Connecticut River valleys. Begin the drive in North Adams, a town known mostly as home to the Massachusetts Museum of Contemporary Art. It also holds an annual Fall Foliage Festival toward the beginning of October, complete with a parade. From there, head to Greenfield where a three-story lookout tower will provide the best photo-ops of the drive. Continue into Mohawk Trail State Forest, where old-growth forest filled with maple, ash, beech, and birch trees surround your car in a blanket of bright hues. Beyond that, a couple of ziplines await at Zoar and Berkshire East in Charlemont, which is the perfect way to get some time outside the car. Or you can stretch your legs along the nature trails at High Ledges wildlife sanctuary in Shelburne. Then, cross Deerfield River in Shelburne Falls, where the water meanders through towering bright colors for the most scenic cityscape of the drive. Though U.S. 7 stretches through Connecticut and Massachusetts too, the most scenic stretches are found in the Green Mountain State. Start the route in quirky, funky, Burlington and take in the foliage on a bicycle during a Bike and Brew Tour of the city. Then begin your drive along Lake Champlain, stopping frequently to snap envy-inducing pictures of the trees surrounding the lake. Continue on to Mt. Philo State Park, where a short drive to the top of the mountain provides the most dramatic views of the drive, looking out over the lake and valley below. Head into Middlebury, where the Otter River snakes through town flanked by brightly colored trees. Pass by the Shoreham Covered Railroad Bridge on your way to Brandon, a small town with 243 buildings on the National Register of Historic Places. Enjoy its charm before driving to Wilson Castle in Rutland, an awe-inspiring home that includes the Norman Rockwell Museum. Then pass through the Green Mountain National Forest before finishing in Bennington, a city with five covered bridges all surrounded by thick forest. The Litchfield Hills region of Northwest Connecticut is the peak spot in the state for fall colors. 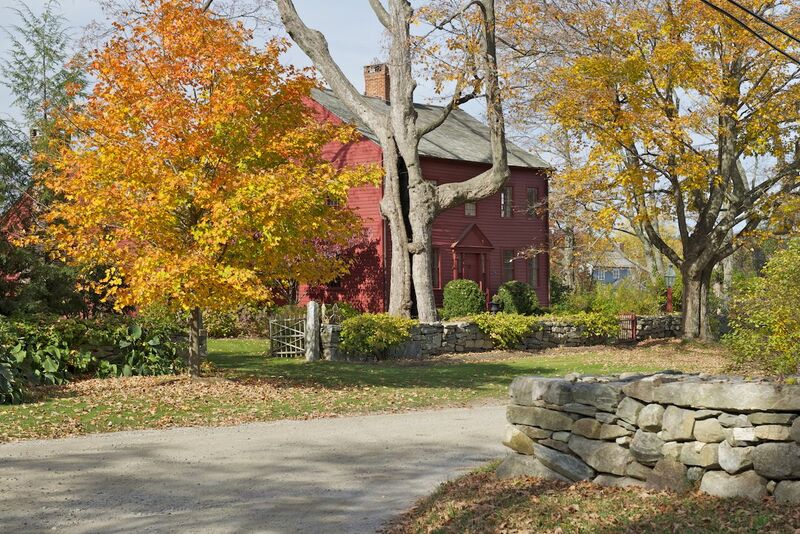 Start out around Ridgefield and hit the Keeler Tavern Museum, where you’ll learn about life during colonial times and see this majestic white building contrast with the stunning trees. From there, dip into Danbury, another historic district filled with houses that date back to the 1780s. Next is the scenic highlight of the drive at Kent Falls State Park, where you’ll hike to one of the biggest waterfalls in the state along a colorful path. 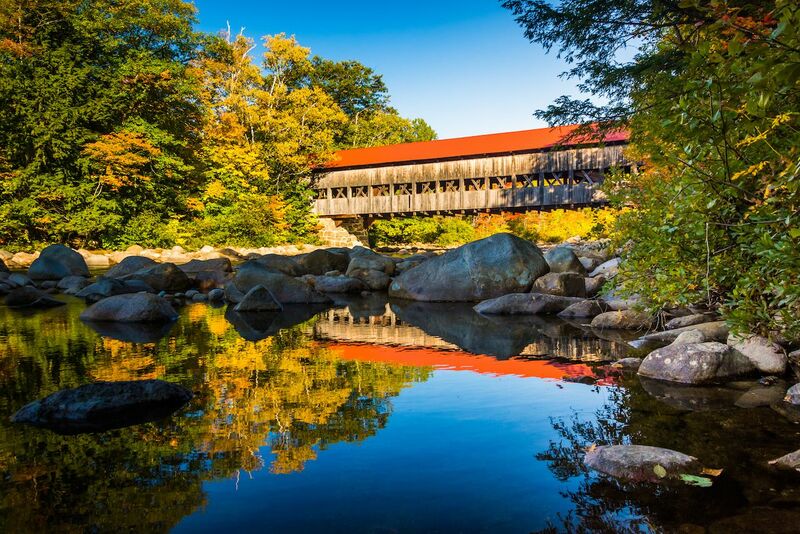 Take a short detour off Route 7 to Route 128 into West Cornwall and traverse the city’s famous red-covered bridge, then take in views of autumn over the Housatonic River. If you’re feeling strong, take another detour off Route 7 onto Route 126, and you can hike a stretch of the Appalachian Trail to get the blood moving. Or make a stop in Woodbury, considered by some to be the antiques capital of New England. Though you’ll probably be sharing it with every leaf-peeping tourist north of the Mason-Dixon Line, this 27-mile loop thfough one of America’s most striking national parks is still worth the traffic. The park is at its peak this time of year, when the imposing figure of Cadillac Mountain seems a little more friendly when covered in reds and yellows, so try to visit on a weekday to avoid the majority of the crowds. 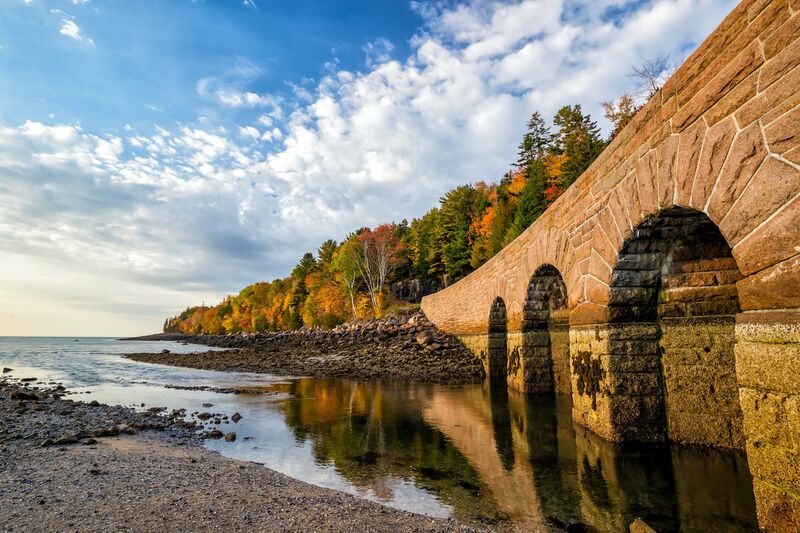 Stand among the boulders in one of Acadia’s famous beaches for a striking contrast between the blue ocean and the bright trees on the shore. Or take a bicycle through some of the park’s less-traveled roads. The best time to catch the colors is around the middle of October, both because it’s peak foliage time and also because the weather is the best for hiking. Assuming that Mother Nature cooperates, you can hike to the top of Cadillac Mountain and see the colors spread out over the park, with sweeping views of the Porcupine Islands in the distance.